This is an interactive intimate course limted to 15 seats for individuals seeking skills sharpening and concept refreshment. The aim of the workshop is to focus on MI purpose and process emphasizing cultivating and nurturing the conversation for change. Participants will receive a binder with research supported information and an introduction to the Motivational Interviewing Network of Trainers. Directions to 25 E Washington in Suite 1025- a block from The Bean! 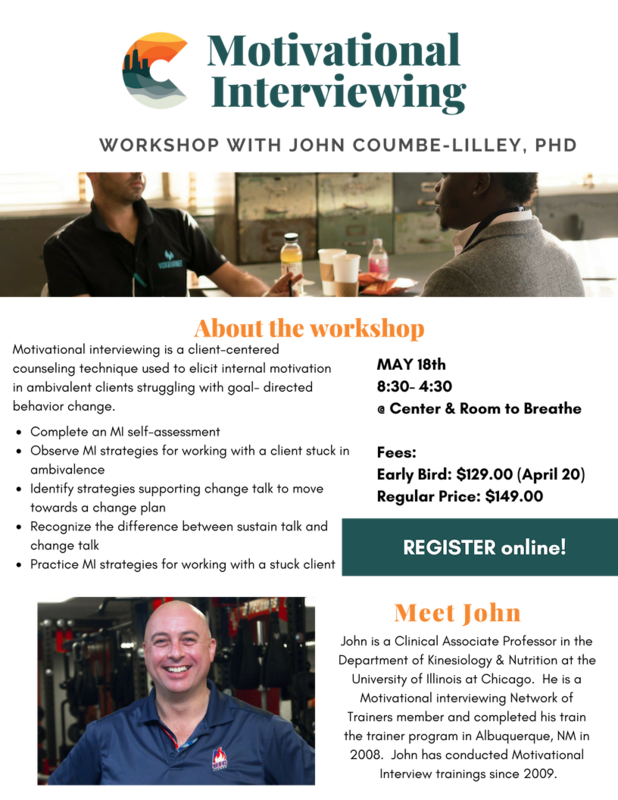 This is a skills workshop for professionals who specialize in helping individuals thinking about making a health behavior change to get started. I follow a 3-step process for each session, a brief introduction, learning activities and summary to end the session. Can I follow up with you after the workshop? Yes. Contact me after the workshop and let’s talk a bit. Are continuing education credits available for this workshop? Sadly none are offered this time around. I hope to offer them the next time around. What learning theory is used for this workshop? This workshop adapts David Kolb’s experiential learning theory to ensure every individual experiences the workshop positively. The ratio for learning is about a 70 (active learning) / 30 (discussion and reflection). Is there much evidence behind the content of the workshop? Yes. Check the binder for the evidence supporting this workshop. If you are wondering about MI research conduct a search and share your knowledge at the workshop. Early registration Fee is $129.00 if registration completed before 4/20/19. $149 after.